*The Create It! art room closes at 3:30. Mastercard, Visa, Discover cards, and cash or check are accepted. 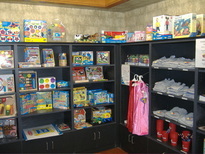 Choose from a wide variety of toys, CWCM clothing, CD's and more!